In 1785, sixty Catholic families from Charles, Price George, and St. Mary’s counties in Maryland formed a league pledged to emigrate to Kentucky (then still a county of Virginia) within a specified period of time. By settling together for mutual support and protection, they also hoped that their spiritual needs would be quickly recognized by Bishop John Carroll of Baltimore, appointed the previous year to lead the United States’ first diocese, which encompassed the entire country. The first twenty-five families found a new home near the headwaters of Pottinger’s Creek in the hilly Knobs region of the commonwealth. Holy Cross, the first Catholic church west of the Allegheny Mountains, was built here in 1792, the same year Kentucky was recognized as a state. At that time, this area became Washington County (named after George Washington), a part of which in 1834 was renamed Marion County, after General Francis Marion, the “Swamp Fox” of the Revolutionary War. In 1793 Father Stephen Theodore Badin, a religious exile from the French Revolution and the first Catholic priest ordained in the United States, was assigned to missionary work in Kentucky by Bishop Carroll. Badin walked from Baltimore to Pittsburgh, where he boarded a flatboat to Limestone (now Maysville). He lived first near Holy Cross, then in late 1794 moved a few miles away to St. Stephen’s Farm, where he had built a chapel named after his patron saint. From there he traveled by horseback to serve all of Kentucky’s Catholic families, then numbering a little less than seven hundred. Within twelve years this grew to nearly seven thousand, scattered throughout the entire state. In 1805 the Bishop sent Father Charles Nerinckx to assist Badin. The eldest of the fourteen children, Nerinckx was born in Herffelingen, Belgium, on October 2, 1761. After studies at Enghien, Gheel, and Louvain, he entered the theological seminary of Mechlin in 1781 and, after his ordination in 1785, became vicar at the cathedral there. (The Dutch-speaking town of Mechelen, in the province of Antwerp, Flanders, is known in French as Malines and in English as Mechlin.) In 1794 Nerinckx moved to Everberg-Meerbeke (near Louvain), where he was pastor and rebuilt the parish church. But in 1797 the Belgian government, still under the power of the anticlerical French Directoire, required that all priests take an oath of hatred against royalty. Nerinckx refused, and evaded arrest for seven years by hiding at the Hospital of Dendermonde, which was administered by his aunt, a Benedictine nun; during the day he hid, often in the attic or a chicken coop, while at night he ministered to Catholics in need and conducted masses at 2 a.m. In 1804 Nerinckx finally managed to escape by walking ten days to Amsterdam, where he boarded a ship bound for America and landed in Baltimore. Bishop Carroll first directed Nerinckx to study English at Georgetown in Washington, D.C.
Like Badin, Nerinckx practically lived in the saddle. The two priests journeyed separately through all of Kentucky for several years, but divided their territory in 1812. It took Nerinckx six weeks to make a circuit of his district, roughly a two-hundred-mile square covering nearly half the state. He moved to the Hardin’s Creek congregation in Marion County, a little more than ten miles from St. Stephen’s Farm and several miles east of Pottinger’s Creek, taking up residence in the vestry at the rear of the church, which he had named St. Charles in honor of his patron saint. Soon after his move Nerinckx, with three dedicated local teachers, founded the first community of religious women in the United States, originally called The Little Society of the Friends of Mary at the Foot of the Cross. Mary Rhodes had already begun a school in a small dilapidated log cabin abandoned by a settler about a half mile from St. Charles; later she was joined by Christina Stuart, and then Ann Havern. For convenience, they fixed up a nearby log cabin where they could sleep in a loft, with beds for boarding students laid out on the bare ground floor of the living area at night and stored on the “high shelf” by day. The straw beds had plain covers, not fancy quilts, and their work table was half a split log. A combined kitchen and refectory (dining area) used a table made of boards nailed to a stump left standing in the middle of the cabin by the former tenants, who probably had used it for a similar purpose. As construction began in earnest, trees around the two existing cabins were felled and hewed into logs, which both provided building materials and cleared the area. Nerinckx staked out the places to erect each structure and the sisters themselves rid the yard of stumps, chipping them down then burning away what remained. Once foundation timbers were laid, small stones hauled from Hardin’s Creek were built up under them for support, with mud and straw used to fill in empty crevices. The sisters and their neighbors helped with the construction, and whenever in town Nerinckx pitched in as well; it was noted that for years afterward the imprint of his fingers could be seen in the clay mortar plastered into the spaces between logs. Nails and glass had to be purchased and sometimes a little cash was needed by hired builders. Francis Melton of Washington County contracted to build “three double cabins of sixteen feet in the clear, with a passage between them of eight feet, to be finished in a workmanly manner, and completed before the end of July, 1813, – the timber to be taken, as much as possible, from General Walton’s and other willing neighbors’ land – Charles Nerinckx to pay for the work sixty dollars in cash, and sixty dollars in trade rated at the common trade price, at Mr. Charles Hayden’s on Pottinger’s creek.” In 1814, Nerinckx found in Pittsburgh handy new cooking appliances that could alleviate some of the sisters’ housekeeping chores, for $100 apiece plus transportation costs; called stoves, these were the first to be seen in the county and possibly the entire state of Kentucky. 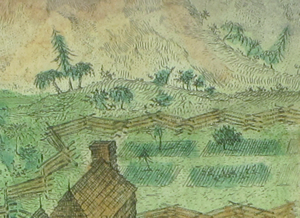 The plan created by Nerinckx called for two rows of buildings, with a large square yard extending back from the road between them. The first building to the right of the entrance was the school, a one-story double cabin with its wooden chimney outside. Next came the chapel and convent, a structure two stories high that consisted of two square cabins with upper rooms; the space between the cabins was enclosed by weather-boarding to form the chapel. (The two rooms at either side of the chapel were intended for use by the community, but not completed until two years later.) The third building, a similar double cabin, was used for the kitchen and refectory. On the left, the first building was Nerinckx’ residence, which it is said he built with his own hands. Like the school, it was a one-story double cabin having a wooden chimney outside and with the space between protected by weather-boarding to form a small entry; one room served as his sitting room, study, bedroom, and refectory, while the other was reserved as accommodations for the Bishop or visiting priests. In the second building was Nerinckx’ kitchen; his cook took the priest’s meals over to the St. Charles sacristy when needed and also ran errands for the sisters. The third building served as a work room, an infirmary, and a guest house. As soon as his own house was finished, Nerinckx moved to Little Loretto. The two old cabins that had served as schoolhouse and convent were torn down and their logs used to build a small double cabin at the far end of the yard, which first was a meat-house and later a dwelling. Behind were built stables and outhouses, at convenient places and distances. The extensive square yard was leveled and sown with blue grass. A small plot at the outer side of the chapel was reserved as a graveyard for the sisters and planted with trees, shrubs, and flowers; a large square cross was placed in the middle, surrounded by an evergreen arbor. A rail fence was built around the buildings and yard. Outside the fence was a garden that extended to the summit of the hill and, on the opposite side, stretched to the creek; on its downward slope Nerinckx himself planted an orchard. While in Belgium, Nerinckx commissioned two works of art. 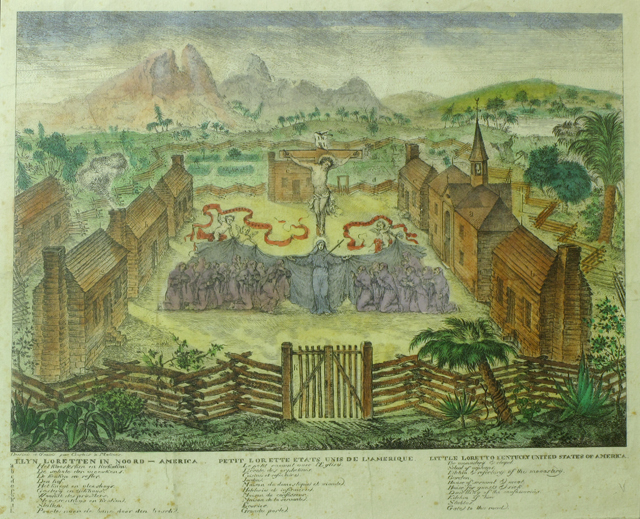 One was the engraving of Little Loretto shown here that illustrates the site, with the sisters surrounding a vision of Mary and the Crucifixion at center; at bottom is a key in Dutch, French, and English that identifies the buildings by letter captions. Although probably made from a design provided by Nerinckx, it is likely the European engraver, unfamiliar with Marion County, Kentucky, who was responsible for the fanciful botanical and topographical elements such as the palm trees and tropical flora, rocky mountain peaks, and a sizable waterfall. The other artwork was a woodcut of “the Suffering Jesus on the Cross, almost hidden by a huge flaming heart. In the gaping wound of the Divine Heart the pierced Heart of Mary is seen, surrounded by smaller hearts representing the professed sisters … On the rock at the foot of the cross the standard of the Society waves: “O Suffering Jesus! 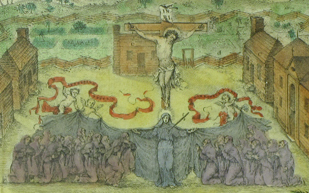 O Sorrowful Mary!” and a picture of the old Loretto Convent is seen in the background… One of these [works] Father Nerinckx had framed, with glass on both sides, the reverse bearing … [a lengthy religious inscription] in his own handwriting.” In the engraving here, two crimson banners carried by angels bear the same words. According to one biographer, “There were also many paintings, some of them very valuable, which through the help of his great friend, Mr. Peemans of Louvain, he secured from churches that had been wrecked and sacked by the French. Among the best of these was a Crucifixion, now in the church at Bardstown, and a supposed genuine Van Dyke in the Cathedral of Louisville, representing St. Bernard with the Sacred Host, administering a solemn reproof to William of Aquitaine for his schismatical and disorderly conduct.” Some of the paintings owned by the Archdiocese of Louisville (the seat moved from Bardstown in 1841) have been on display since the Cathedral of the Assumption’s renovation in 1994. In 1824, Nerinckx requested permission to move farther west. Bishop Joseph Rosati of New Orleans assigned Nerinckx to the Upper Louisiana Territory, now Missouri, where he hoped to develop missions among Native Americans. Ironically, Bishop Carroll had recommended in 1808 that Nerinckx be appointed Bishop of New Orleans, but Nerinckx had declined the honor because he thought there was too much to be done in Kentucky. Since arriving in the state, Nerinckx had organized at least one new congregation a year in settlements with a substantial Catholic population and was directly responsible for the construction of more than a dozen new church buildings. Nerinckx told the sisters of his decision in person and also wrote them a farewell letter. 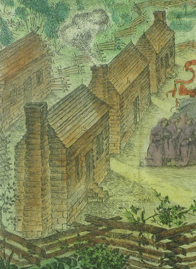 After leaving Little Loretto on June 16, Nerinckx visited their first school outside of Kentucky, which the sisters had been invited to establish the year before at The Barrens in Perry County, Missouri. Less than two months later Nerinckx contracted a serious fever and died on August 12, at the age of sixty-three, in St. Genevieve, Missouri. 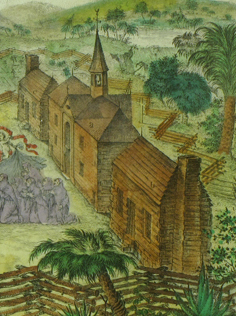 After Nerinckx’ death, Bishop Flaget requested the sisters relocate from Little Loretto to St. Stephen’s Farm. Badin, who had lived there until 1819, transferred the land to them at the request of the Bishop, as an exchange for property occupied by a boys’ school. Heeding Nerinckx’ admonition to “Be united and pull the same way,” the sisters moved, by wagon. After settling in at the farm, they returned to Little Loretto to set fire to all the buildings except for Nerinckx’ cabin; they regarded their original home as sacred ground and did not want the buildings to fall into the hands of others. The community nearby took its name from the sisters and by 1833 was large enough to have its own post office; Loretto is now best known as the home of Maker’s Mark, one of Kentucky’s famed bourbon whiskeys, distilled at Star Hill Farm. By the time of Nerinckx’ death twelve years after its founding, the Sisters of Loretto had grown to more than one hundred members and established six schools and five convents in two states, with an auxiliary called the Jericho Branch at Mechlin, Belgium; over the years, they had established forty-two schools in Kentucky. Land donated in Nelson County for a school that Nerinckx had named “Gethsemani,” which later closed in 1848, was sold to Trappists from the Abbey of Melleray in western France. The Abbey of Our Lady of Gethsemani, now considered the motherhouse of all Trappist communities in the United States, is the oldest monastery still in use in this country; it is also well-known for the spiritual writings of Thomas Merton (Father Louie) and its handmade cheese, fruitcake, and fudge from Gethsemani Farms. The Sisters of Loretto currently have communities in sixteen states and in Europe, Canada, South America, and Africa. The motherhouse is still located in the rural town of Nerinx, renamed from St. Stephen’s Farm in honor of their founder; the Nerinx post office, about 60 miles from Louisville, opened in 1899. Badin’s residence, the first brick house in Marion County when it was built in 1816, is still in use. Ten years after his death, Nerinckx’ body was transported to the motherhouse for burial and a marble statue of him was erected in 1910; half of his cabin at Little Loretto was brought back to the motherhouse in 1895, where it is still on view. Note: A map in this article, drawn in the early 1950s, depicts five counties in central Kentucky which became known as the “Holy Land” of Kentucky.